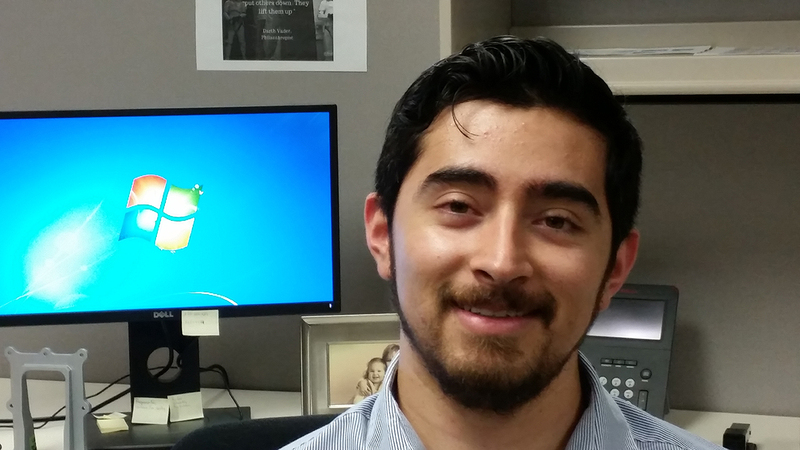 Since he was little, Pedro Figueroa wanted to excel. He loved math, and he loved computers. Although he grew up in Mexico, he spent two years in Wichita at Horace Mann Elementary School – that’s where he learned English. After those two years, he and his parents headed back to Mexico. But during high school, he came back to Wichita and enrolled at Wichita North High School. After high school, Figueroa decided to attend Butler Community College and pursue his dream, a degree in engineering. At Butler, he studied pre-engineering. Pedro was part of HALO (Hispanic American Leadership Organization) during his time at Butler. Once he graduated from Butler, Figueroa transferred to Wichita State University, eventually obtaining both his bachelor’s and master’s degrees in mechanical engineering. At WSU, he became involved in SHPE (Society of Hispanic Professional Engineers), moving from secretary to vice president and finally to president of the organization. During his time as president, Figueroa began a science night at Wichita North High School. The event still thrives, and Figueroa continues to be a part of it. He is currently a mentor to several high school and WSU students. Figueroa talks about both his education and his work with students, explaining to them that no matter the difficulty, they too can succeed. He is excited about both mentoring and his job at the Wichita office of Rockwell Collins, where he designs airplane cabin interiors. His advanced degree helps him at work. Figueroa wants to continue to give back to his community and mentor for as long as he can.